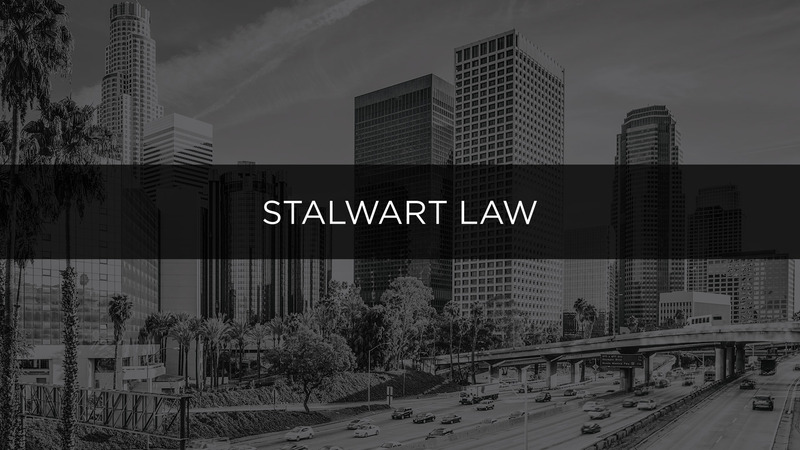 Stalwart Law Group is a boutique civil litigation firm comprised of talented trial lawyers who made the decision to leave big law in order to provide their clients with superior legal representation in a more entrepreneurial and focused manner. Our team graduated from some of the top law schools in the country and spent many years practicing in internationally-recognized law firms. We litigate with a high level of professionalism but are fiercely competitive in the courtroom. Our clients’ satisfaction is our top priority, which is why we always are available to provide personal attention and we work with our clients to match their litigation objectives with their personal and business needs. Stalwart Law Group did an amazing job prosecuting a complex matter on my behalf. I could not believe how quickly they were able to get it resolved. The outcome greatly surpassed what I had hoped to receive and I could not be happier. I highly recommend SLG. Among the nearly fifty litigation matters that I’ve been through, Stalwart Law Group by far has provided me with the best results at the best cost. The firm’s creative litigation strategy has brought me surprisingly positive results time and again. It is my opinion Stalwart Law Group did an excellent job representing me. They listen carefully to questions and comments and always responded quickly with advice aimed directly at my issue. I would recommend them to my friends and family. Stalwart Law Group is an amazing firm! They truly treat you like family and take on your case as if it is the most important case to them. They have always answered my calls and emails immediately. I will always be indebted to SLG for the support, patience and hard work that they put forward on my case. Results-driven, award winning legal firm with impeccable service delivered in a strategic, intelligent, and aggressive fashion – that is what success looks like. I was a client, like many who faced challenging issues, which were mitigated by Dylan and the Stalwart Law Group team to a successful conclusion. There is a reason they have been cited one of the best legal firms; meet them, and you will understand. Thank you Ji-In & your SLG colleagues for being “my voice”. Lawsuits are difficult and quite often the first thing that is compromised is the truth and lastly your life. Your team challenged the other party to face the truth and hear “my voice”. That is the 1st step towards justice. The final step was a quick, fair and equitable outcome. I am forever grateful to SLG for getting my life back and most of all my dignity. We have litigated and tried all types of catastrophic injury and other serious personal injury cases, including traumatic brain injury, auto collisions, medical malpractice, wrongful death, and others.